Games Desktop pop-up is the PUP that uses misleading techniques to prevent removal. Use Reimage to locate malicious components and get rid of them faster than with uninstall instructions. A full system scan blocks virus reappearance and prevents traffic to malicious domains. How can Games Desktop hijack my computer? How to remove Games Desktop virus? 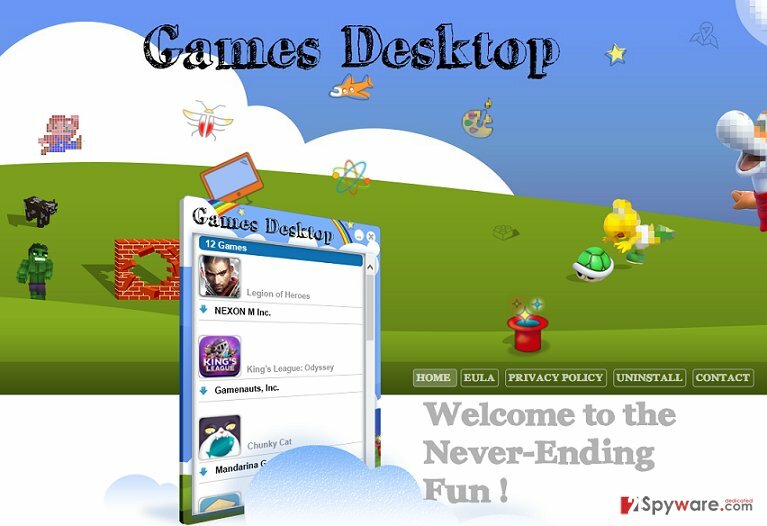 If you are not fond of online games, probably you won’t even consider installing Games Desktop. However, if you tend to play some online games during a spare minute, you may fall into installing this app because it claims being able to wrap all the best rated online games and allow installing them on your computer for free. Sounds good, isn’t it? But please, don’t fall for this because, in reality, this app is just another adware that seeks to create a traffic to sponsored websites and in this way earn easy money. To achieve this, it is set to display Games Desktop ads on every web browser that it manages to find on the target computer and trick people into clicking on them. You may doubt how a dubious program may trick people to click on advertisements? Be aware that adware can collect their users and investigate their web browsing habits, such as what websites they prefer visiting, what search queries they often type, what data they enter and so on. According to recently investigated data, Games Desktop virus delivers pop-up ads that contain coupons, promo codes, sales, discounts of relevant products at an attractive price rate. Isn’t that suspicious? Consequently, when ‘Ads by Games Desktop’ attract user’s attention and he/she click on one of them, this app immediately redirects to predetermined website. Such activity is not only annoying and disruptive, but also can reroute you to malicious websites where you can end up with virus or malware infection. To avoid this happening, scan your computer with Reimage or another reputable anti-spyware as soon as you notice Games Desktop widget on your desktop. Games Desktop plug-in is promoted on its official website and can be installed right there. Unfortunately, security experts have found that it is mainly spread using ‘bundling’. This distribution method is very popular among distributors of potentially unwanted programs because people can be quite easily deceived to download bundled installers without being aware of that. That’s because the number of people whose computers got adware or another unwanted program infection increases daily. Be very careful when downloading free software from the Internet because you cannot distinguish bundled installers from ordinary ones from the outside. Therefore, it is very important to take your time during the installation process and carefully monitor the entire process. Make sure that you select Advanced or Custom installation option because it discloses all available check boxes. Then, carefully check every notification and look for additional components, such as add-ons, plug-ins, toolbars or extensions set by default. Be aware that they are always promoted as useful tools, such as online shopping ‘helpers’, Internet speed enhancers, ad-blockers and so on. Do not fall for this and opt out of every additional component, including Games Desktop virus. In case you have already installed it, don’t worry. Follow the guidelines below and get rid of it right now. Do not wait until GamesDesktop application starts showing you annoying pop-up ads, in-text links and banner ads that could easily reroute you to questionable websites. If you think that such activity is not an appropriate for gaming app, you should look for another one and also remove this program from your computer. For that, follow removal guidelines below and think which method is better for you, automatic removal or manual removal method. Here, look for Games Desktop pop-up or any other recently installed suspicious programs. Wait until you see Applications folder and look for Games Desktop pop-up or any other suspicious programs on it. Now right click on every of such entries and select Move to Trash. When in the new window, check Delete personal settings and select Reset again to complete Games Desktop pop-up removal. Once these steps are finished, Games Desktop pop-up should be removed from your Microsoft Edge browser. Here, select Games Desktop pop-up and other questionable plugins. Click Remove to delete these entries. Now you will see Reset Firefox to its default state message with Reset Firefox button. Click this button for several times and complete Games Desktop pop-up removal. Here, select Games Desktop pop-up and other malicious plugins and select trash icon to delete these entries. Click Reset to confirm this action and complete Games Desktop pop-up removal. Here, select Extensions and look for Games Desktop pop-up or other suspicious entries. Click on the Uninstall button to get rid each of them. Now you will see a detailed dialog window filled with reset options. All of those options are usually checked, but you can specify which of them you want to reset. Click the Reset button to complete Games Desktop pop-up removal process. This entry was posted on 2015-10-01 at 02:53 and is filed under Adware, Viruses. You can quickly scan the QR code with your mobile device and have Games Desktop pop-up virus manual removal instructions right in your pocket. How did you remove Games Desktop pop-up virus?